It is amazing to me when a simple story can spark the imaginations of my children and inspire hours of creative play as well. 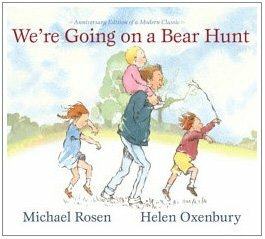 Recently, we picked up a copy of We're Going on a Bear Hunt, retold by Michael Rosen and illustrated by Helen Oxenbury. The repetitive text and beautiful illustrations combined with an adorable story have made it perfect for my 2 and 4 year old. Books that use onomatopoeia are especially good for this age group. I also find that, for me, sound effects make reading a book out loud over and over again more palatable. The "squelch, squerch" of the mud and the "hoooo woooo" of the wind are particular favorites with my kids. Since purchasing a copy of this book, we have read it and re-read it. Each re-reading is followed by an enthusiastic, "again!" Jellybean likes to say the words with me, especially the phrase, "Oh no! We'll have to go through it!" Her sweet, "oh no!" gives me a kick. Every. Single. Time. When reading is done, I've had fun acting out the story with my children. The front door rug becomes the oozy mud, the carpeted dining room becomes the wavy grass and Daddy's office becomes the gloomy cave. We've even discovered the bear a few times, rushed up the stairs, run into my room, jumped into bed and hid under the covers. Buddy loves to wander the house now, hunting for a bear. He's very vigilant and doesn't let any obstacles get in his way. It's not a new book. I'd heard the name and seen it on bookshelves before, but hadn't ever read it myself. In fact, I may be the only person who hadn't read it until now. If you are like I was and haven't had the opportunity, it's well worth adding to your collection. I'm looking forward to all of the bear hunts I'll get to go on with my children in the future.